Plan ahead. Look at a map. And only try to get to a couple of places along the course to root on runners. That's the advice from Twin Cities Marathon spokesman Charlie Mahler to the 300,000 spectators expected to turn out to watch the 31st annual race from downtown Minneapolis to the State Capitol in St. Paul. Mahler also advises the 12,000 runners participating in the 26.2-mile race and the TC 10-mile race to get to the Metrodome starting line early. Roads near the stadium between 5th and 11th Avenues and between 3rd and 6th Streets will be closed at 5 a.m.
Barricades along the course will go up at 7:30 a.m. the on parkways that wind past the Chain of Lakes and through south Minneapolis. They include Dean, Calhoun, Lake of the Isles, Minnehaha parkways and West River Road. Closures will remain in place until final runners pass. Motorists needing to cross the course are encouraged to use 35W or Nicollet or Hiawatha avenues as a north-south alternate and Lake Street as an east-west alternate. In St. Paul, East River Road, Summit Avenue and John Ireland Blvd. will be blocked to traffic until the race ends around 2 p.m. Parking near the finish line will be a challenge as several streets are ripped up for light rail construction. Mahler suggests parking in the Sears lot on Marion Street, or in neighborhoods along Selby and Summit Avenues. "They can watch their runner in the final mile or half-mile," then walk down to find them at the finish line, he said. 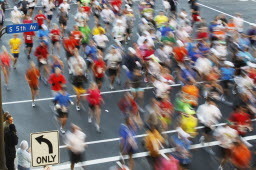 During the race, "my advice is not to try to see their runner too many times," he said. "General advice is to pick a spot near the start and near the finish."